The founder of the Davhana chiefdom was Davhana Ramabulana, the first born son of King Rasithu Ramabulana. 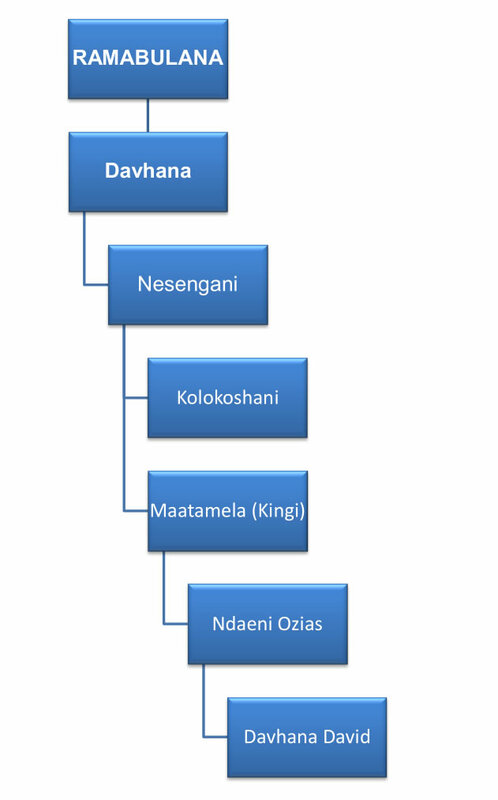 Davhana, as King Ramabulana’s eldest son, should have taken over the reign after King Ramabulana’s death. But Makhado, the youngest son, assumed the reign of Venda Kingdom, with the assistance of Makhadzi Nyakhulu and Khotsimunene Madzhie. Makhado was considered to be brave and was the most popular among his brothers. After Davhana, the first born son of King Rasithu Ramabulana, was defeated by Makhado in the war of succession, he fled to Luonde and sought refuge from Joao Albasini. Albasini was a Portuguese trader who came from Mozambique. He was accompanied by Tsonga refugees who fled Mozambique after the war of succession broke out for the Tsonga-Shangaan kingship in Mozambique. 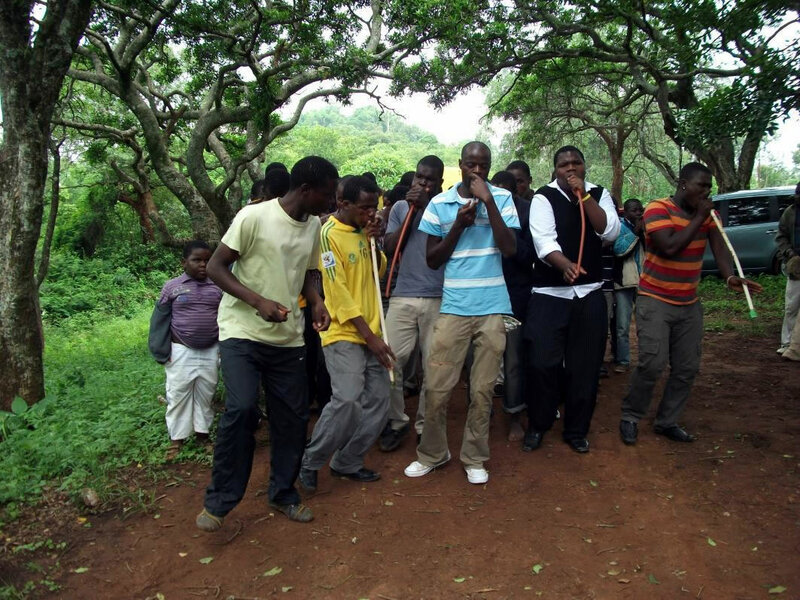 The fight was between Mawewe and Mzila. Albasini appointed himself the white chief of the Tsongas who fled Mozambique. Albasini was appointed Native Commissioner for Venda by the Transavaal Republic, before Venda was conquered. His position over Vhavenda was therefore not recognised by anybody. Albasini settled, without Khosi Matidze’s permission, at Luonde. Makhado wanted Albasini to deliver Davhana to him, but Albasini refused to do so. 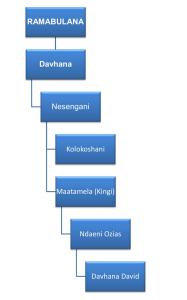 Davhana, who had not given up on becoming the king of Venda, tried many times to attack Makhado. Albasini also did not like Makhado because the king did not recognise his authority and had forbidden his people from paying taxes levied by Albasini. After the destruction of the Boer settlement of Thivhalalwe (Schoemansdal) and the expulsion of the Boers led by Paul Kruger in 1867, Davhana, Albasini and Boer authorities formed an alliance to oust Makhado from the throne. Davhana promised Albasini and the Boer authorities that they would have control over the whole of Venda if he (Davhana) became king of Vhavenda. Davhana and Albasini approached the Swazi for military assistance. Their ultimate objectives were quite simple. Makhado’s defeat would enable Davhana to regain the Vhavenda throne. Albasini would feel more secure. At the same time the Boers would return to Venda. Albasini directed the Swazi to attack Sunguzwi, Dzanani and Tshakhuma. Davhana ordered that Khosi Madzivhandila be attacked first since he was King Makhado’s father-in-law. The aim was to cut Khosi Madzivhandila off from rendering assistance to King Makhado. The Swazi impi were defeated by Tshakhuma fighters on Mount Mangwele. Tshakhuma women, such as Mudzunga Madzivhandila (who was Khosi Tshivhase’s daughter and also the wife of Khosi Raluthaga Madzivhandila) and Nyatshivhuyahuvhi, a princess of Tshivhazwaulu, participated in the fight against the invaders and killed a lot of them. Mudzunga and Nyatshivhuyahuvhi distinguished themselves as outstanding fighers in the battle of Mangwele3 . The Swazi impi then tried to attack King Makhado’s royal residence on 18 October 1869. Venda troops successfully repelled the attack by killing a lot of Swazi men. Swazi survivors fled south-eastwards towards Shehe (present day Elim). The defeated Swazi returned home. When they passed through Bopedi, they were ambushed by King Sekhukhune’s warriors who further decimated them. According to Professor Mphaya Nemudzivhadi, no oral sources could provide any definitive information as to whether there was any arrangement between Makhado and Sekhukhune concerning this episode. What is known is that King Makhado and King Sekhukhune were on good terms as they regarded each other as brothers. The defeat which the Swazi sustained at the hands of the Venda enhanced Makhado’s esteem throughout Venda. The defeat of the Boers and the Swazis by Makhado led to Davhana finally accepting that he would never dethrone Makhado. Davhana left Luonde, crossed Muhohodi and Luvuvhu rivers and settled at Mpheni village on Mount Luvhola. King Makhado did not pursue Davhana due to the fact that in terms of Tshivenda rules of combat, an enemy that fled and crossed a river as big as Luvuvhu was not supposed to be pursued. Davhana had already crossed Muhohodi and Luvuvhu rivers into Luvhola, and this was a demonstration that Davhana had lost the war of succession. Makhado, however, strategically placed Mahosi loyal to him in places surrounding Luvhola to monitor Davhana’s activities and to guard against any possible attacks from Davhana. 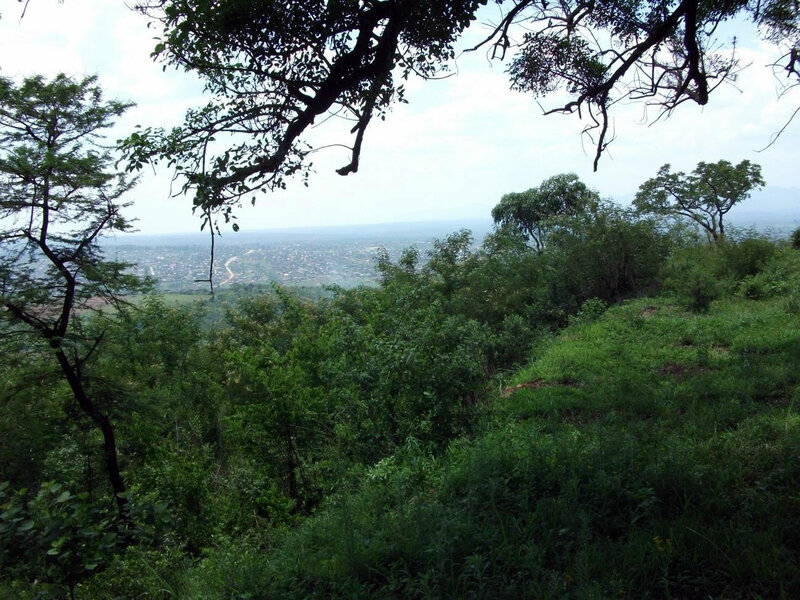 Davhana settled at Mpheni on Mount Luvhola and reluctantly acknowledged Makhado as the king of Venda. It is said that Davhana sent messengers to Makhado in 1870 to plead for peace and to state that Davhana was acknowledging Makhado as the king of Venda. Makhado responded by saying “u si nthumele tshira ngauri wo luvha”, meaning ‘don’t you ever provoke me now that you have acknowledged me as you king’. That very year, Makhado’s wife, Dombo (the daughter of Raluthaga Madzivhandila) gave birth to Makhado’s second son who was named Sinthumule, from ‘u si nthumele tshira’. To the north, north-east, and north-west of Luvhola there were other communities loyal to Makhado such as Tshitungulu, Tshifhefhe, Tshidzivhani, Tshivhodza, Marandela, Ramaite, etc. Communities such as Manavhela (Ramovha), Folovhodwe, Mamphodo, Mushasha, Begwa, which were south and south-west of Luvhola were also loyal to Makhado. Davhana was, therefore, completely surrounded by Mahosi loyal to King Makhado. These Mahosi were instructed to monitor Davhana’s activities and to guard against any possible attacks from Davhana. Ya tiba Makhado ri a lwa. Davhana settled on Mount Luvhola without displacing Vhakwevho of Luvhola. He co-existed peacefully with Vhakwevho of Luvhola and did not interfere with their shrines. He became the khosi of Luvhola until his death in 1894. Venda-speaking communities were forcibly removed from Old Mpheni and Luvhola in 1966/67 to make way for a timber plantation. Vhavenda from villages around Mount Luvhola, known today as Chabani, Njakanjaka, Shirley, Lemana, Mbokota, etc, were also forcibly removed in 1966/67. This was after these areas were, in terms of the apartheid’s Group Areas Act, declared Tsonga-Shangaan areas and incorporated into the newly created Gazankulu Bantustan. Davhana died at Mpheni, on Mount Luvhola, in 1894. His sons were Mudumela, Tshingwala, Nesengani, Ramphaga, and ‘Musathanyoko’. Old Mpheni On Mount Luvhola. ‘New’ Mpheni Village Can Be Seen in The Valley Below. He was succeeded by his son, Nesengani. Nesengani’s sons were Kolokoshani and Maatamela. After Nesengani’s death the Boers divided the Davhana chiefdom into two: Ha-Nesengani, under Kolokoshani, and Ha-Davhana, under Maatamela. Both Nesengani and Davhana chiefdoms had Venda and Tsonga-Shangaan speaking people as their subjects. The Nesengani chiefdom was situated at a place known today as Mbokota, Nwashinyamane, and Chabani. The Vhavenda of HaNesengani were forcibly removed to Tshino (known today as Ha-Nesengani) since Old Ha-Nesengani was declared a TsongaShangaan area, and was incorporated under the Gazankulu bantustan. Forced removals took place in 1966/67. The Vhavenda of Mpheni and Luvhola, under Davhana, were also forcibly removed by the Boers in 1966/67 to make way for Luvhola State Plantation. They were taken to Nngwekhulu as Ha-Davhana. The Venda administration under Thovhele Patrick Ramaano Mphephu successfully reclaimed Luvhola, Mpheni and parts of Shehe (Ha-Ramaru) in 1986. A new village called Mpheni, named after Old Mpheni on Mount Luvhola, was created and settled from 1987/88. Tshikona Performance at Old Mpheni On Mount Luvhola On 18th December 2010 During The Ceremony to Unveil the Tombstones of the Davhana/Nesengani, Ramphaga & Mukwevho Families.